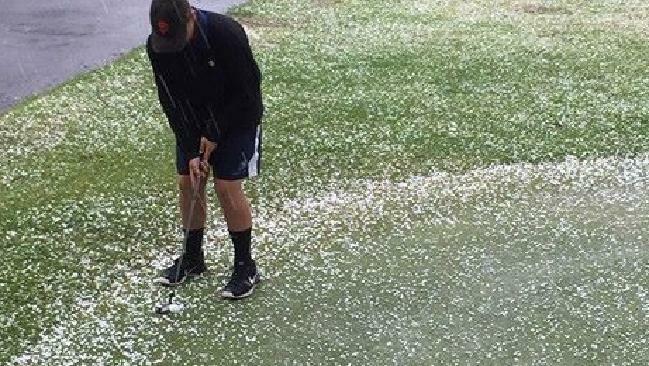 A SMALL town on Tasmania's east coast has been blanketed in hail after an unseasonable downpour on Saturday afternoon. It's not the only place with snow falling in otherwise shuttered ski resorts. Mount Hotham in Victoria saw the white stuff falling this weekend. While the thick blanket had some initially wondering whether the town had received a dumping of snow, the Bureau of Meteorology's Debbie Tabor confirmed it was indeed hail. "A lot of it fell obviously in Orford at that time to give a coverage of white on the ground, but it was definitely hail," Ms Tabor said. "We've had a band of thunderstorms across the eastern districts move through this afternoon. "We've had hail in several places with those thunderstorms and some good rainfall." Pat Haydon, who has a shack at Orford and has been visiting the town for 76 years, said she could see the storm coming from a long way off. "We were running around shutting windows everywhere because you could see the black clouds coming," Mrs Haydon said. "I've never seen it like that in Orford before, I believe there has been snow down here, but we're talking about January, aren't we. "The hail stones hitting my bedroom window sounded like rocks." Orford resident Melanie Rottier said the hail was deafening. at about 1.30 this afternoon," Ms Rottier said. "We can see the highway just from our house, and there was lots of people stopping and taking photos." The wild weather affected events across the state yesterday, with the Hobart International final delayed by several hours and visitors to the Cygnet Folk Festival forced indoors. Between 9am and 6pm there was 21 millimetres of rain at Buckland, and 16 at Campania. Hobart received 11 millimetres of rain in the same period.